Building the Bull River Road. Mandy Maynard (woman in center), S. S. Brown(teamster) and Charlie Maynard (with dark horse) are in this scene. Courtesy 'Granny' and Pauline Gordon collection. ﻿﻿As winter yielded to spring and snow melted under pelting March rains many of the settlers in western Sanders County congratulated themselves on having survived their first wilderness winter in 1906. The Anderson brothers were finishing their boom across the river to enable those having posts and poles coming down the river to take them out without rafting."1. Thomas Evans was fencing the south half of his ranch for pasture and all ranchers in the vicinity of Noxon were engaged in clearing and cultivating. It was the first year that so much of this kind of work was being done in the mountains of northwestern Montana. In July the Commissioners, being also the Board of Equalization, began increasing assessments: Including horses, wagons, harnesses, buildings and household equipment. 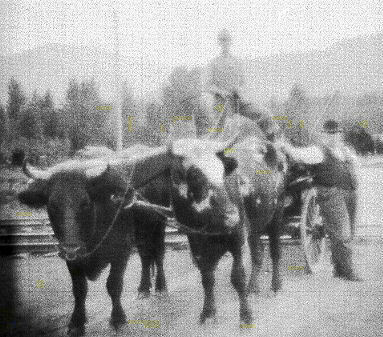 Improvements and taxes included grain land, carriages, musical instruments, machinery and vehicles, stock (cattle at $45 for 25 head; range horses at $5 each). J. P. Colligan and R. H. Chapel, Heron, were listed on real estate improvements. John Erickson, improvement on real estate, $50. Gutherie and Tooey Bros, Noxon, were increased from $4,950 to $10,000. After explanation from their representatives, the $10,000 valuation was reduced to $6,250, increasing their assessment in the sum of $1,300. Montana Lumber Company was assessed for adding 500 acres of stump land at $2.50 per acre ($l,250) and 140 acres of lst class timber at $6 per acre ($840.) This was down from the original assessment of $1,280. Joe Wagner of Noxon also was upped $50 on his real estate. Railroad land was valued at $1 per acre. An assessment for $24.55 for NPRR land was removed. Fur trapping remained an important means of providing cash income for many of the settlers. Cliff Weare once had a time killing a black bear in a trap with the only thing at hand - a double bitted axe. The first whack he took, he hit the bear in the head with the flat of the axe. That didn't kill him. Before the job was done the bear had sunk its teeth into the birch tree and pulled great slivers out of it. Caption: A sled of logs, logger Jess Beason, his wife, Mary, their daughter, Nora, and a friend. Courtesy Clayton Bauer collection. Three carloads of elk were shipped in from Lewistown, Montana and Yellowstone National Park. They were unloaded at Woodland, above Thompson Falls, and then released into the mountains. Jim McGowan took up a collection to pay the freight on them. Swan Swanson, the lanky, blond Scandinavian, attempted to improve the beaver population at White Pine in 1907 by importing beaver from Michigan. Swan was another of the determined men of the valley who were making this wilderness frontier a more secure place to live; a place to raise a family and grow to a contented old age. "I thought they were darker but these [beaver] here are just as dark," he said. "They cost $300. It cost $125 each to freight them in. You had to have tanks; beaver can't go to the toilet unless he has water. I had them several years then I accidentally killed the female. I accidentally trapped her in a live trap and the flood came up on the creek that night and drowned her. I never got track of the old fella." Lumbermen meetings were being held in Missoula in January of 1907. The men were asking for an increase in the scale of wages because of a recent rise in lumber prices. The matter was to be laid before J. R. Toole, President of the Blackfoot Milling Company, Ed Donlan, who had extensive lumber holdings in Sanders County, and C. H. Richardson, who represented the Clark interest in the area. $45 for tail sawyers and common laborers. Nine hours constituted a river driver's day; his pay, $3.50 a day with overtime at 40 cents an hour. Board and room were deducted from the wages. In December Jim McGowan and James Ferguson, lumbermen in the employ of John McGill, who was cutting timber for the Potter Lane Lumber Company, were walking down the railroad track returning to their camp from Heron where they spent the evening when they were struck by Northern Pacific's Number 2 freight train. Each had their right leg cut off and McGowan's head was terribly crushed. They were removed to the hospital in Sandpoint where McGowan later died, the county paying the tab for both. Two or three men were killed in the same spot in a similar manner. As soon as men paid their proper respects at those funerals, their talk turned to the effects of falling silver prices. Silver had dropped to its lowest price in two years, reduced in the past seven months from 70 cents to 58-1/2 cents. The market depression was caused by a heavy fall off of demand from India, ordinarily the buyer of the larger part of the worlds supply. Prospectors grumbled and complained in Noxon's saloons and hashed it over around the pot-bellied stove that warmed the Posts and Poles store. 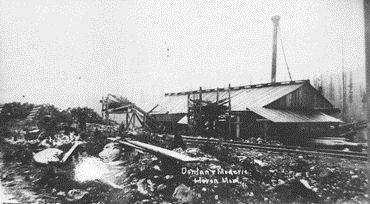 Donlan and Moderie Mill at Heron, Montana. Circa early 1900s. courtesy Georgia Knott MacSpadden collection. Martin were plentiful, with populations of the furry creatures especially numerous on Martin Creek. Trapping still provided part of the economy but already Mountain lions were trapped to near extinction. Weare engaged in trapping in addition to having the Posts and Poles Store and his sawmill at the mouth of Pilgrim Creek. He was also loading out poles at Noxon, shipping them via the NP railroad to Missoula and to the Milwaukee railroad, under construction at the time. Having rapidly expanded his timbering interests, he loved working in the timber; the whine of saws and the thunnk of axes conquering the great forests; the resinous smell emitted into the air with each bite into the sapwood; the jangling of harnesses, shouts and oaths of men working the powerful teams; the pungent odor of decaying plants in the fall; or the crisp freshness of winter, spicily tainted as horses lifted their tails and dropped steaming clumps which blemished the pure white snow. He relished his authority over crews of lumberjacks; savored the feeling of aiding men less fortunate than he by providing them not only with jobs, but with the trappings that accompanied it - camp, bed, meals. He carefully counted the profit to be made on all. Cocksure in his prime, he counted himself in league with the builders of the valley. During his lifetime, it could never be said of Cliff Weare that he was not intelligent. Self confidence was as natural to him as was his good health and exceptional stamina. He pushed himself hard. And expected as much of everyone else involved with him. Possibly his German blood accounted for his intractable nature. The need to succeed and excel ruled his every action. Being thwarted by the new governmental restrictions set ill with him. It made his experience and knowledge of timber and the uses made of it another cause of friction between him and the rangers. A few steam powered sawmills were operating within the working circle area as early as 1908, the largest and most prominent being Donlan and Mobrie's at Cedar Spur just west of Heron, Montana but most timber left the area on the river drives or the railroad. Despite the falling silver prices, Miller continued to prospect ten miles southwest of Noxon near the head of a small stream, Tobin Creek, which is tributary to the south fork of Pilgrim Creek. By late 1910 the six claims were held by the Princemont Mining Company. The quartz vein outcropped on the surface for 2,000 feet, and was eventually developed by three tunnels (adits) 200, 700, and 2,000 feet long. Copper, lead and bismuth were present in the vein, which cut across Newland (Wallace) slates. E. C. Crosby became interested in mail-ordered lots located in Florida available 'for as little as $10 a month'. Soon he began talking up that land to his friends at Noxon. "Those lots will make the best town site in Florida," he said, trying unsuccessfully to drum up interest. from NPRR depot to Buck' Store. ﻿﻿The fun loving, roughneck, daredevil lumberjacks and the challenge of the spring river drives drew Frank Berray like a magnet, enticing him from what he considered the placid ranching life of his father and uncle. 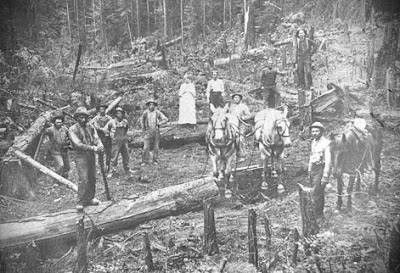 One of the 'sports' in Noxon, Frank was working the spring log drive belonging to the Dover Lumber Company and The Hope Lumber Company which, had formed a massive log jam in the Cabinet Gorge that had been stuck about six weeks. Being the first-born native of Noxon, Frank was now twenty-years old, slim and wiry; a short dark haired daredevil imbued with a wicked sense of humor. "Ten of the drivers took the outfit through in two bateaux, successfully 'shooting' the gorge. Between 20 and 30 tons of dynamite were used in dislodging the jam. Although there were several narrow escapes the river men succeeded in breaking the jam without loss of life. "Dutch Henry had a narrow escape. He was the last to leave the log jam when it passed into the rapids and when he tried to get ashore he was too late. He got on a rock and his companions succeeded in getting a line to him and rescued him from his perilous perch."